Daylite reminds you and your team when to follow up so you're always top of mind with your customers, prospects and vendors no matter how big your network grows. Keep all your interactions with a person in one place. Whether you need to check a note from a call last week or an email from 6 months ago, when your memory fails Daylite saves the day! Don’t let your relationships go stale. Stay in touch and top of mind with your prospects, customers, and vendors. 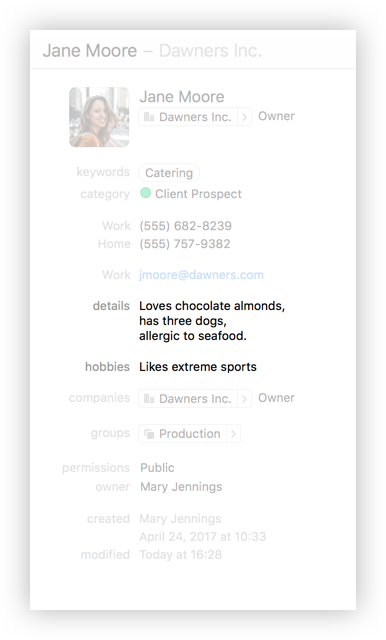 Using Daylite's powerful filtering options, you can organize and segment people & companies to target the right people at the right time. Capture new leads, store emails to a client, and create follow-up reminders all from your email. Know what's on your plate so you're prepared for each call and meeting every day. See who you're meeting with and who you need to touch base with – all in one view on your Home Screen. Get reminders in Daylite so when you say you'll follow up, you do every time. 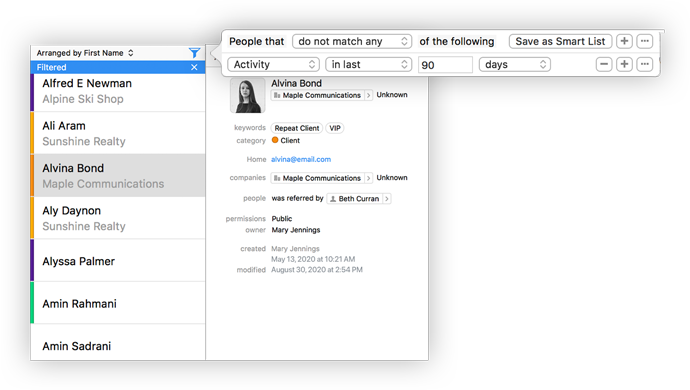 Stop scrambling to find important info about your contacts. With all your contacts shared in Daylite, your whole team can quickly search and find what they need when they need it. Show your customers you care by remembering even the little things, no matter how big your contact list grows. Keep track of how people are related and connected. Track who people were referred by and the companies they've worked for. "Daylite helps us stay on top of contacts and tasks. When we say we will follow-up with someone, we keep that promise." Join the small businesses building stronger relationships with Daylite.